Get the Toothflix 2.0 App plus Complete Series Server Version DVD and save $300 off the individual app price! An appealing mix of live characters and 3-D graphics make Toothflix 2.0 videos an essential educational tool—and it’s so simple, your entire staff can use it. This product contains two subtitled DVDs, English (all videos) and Spanish (all except Dudley videos). 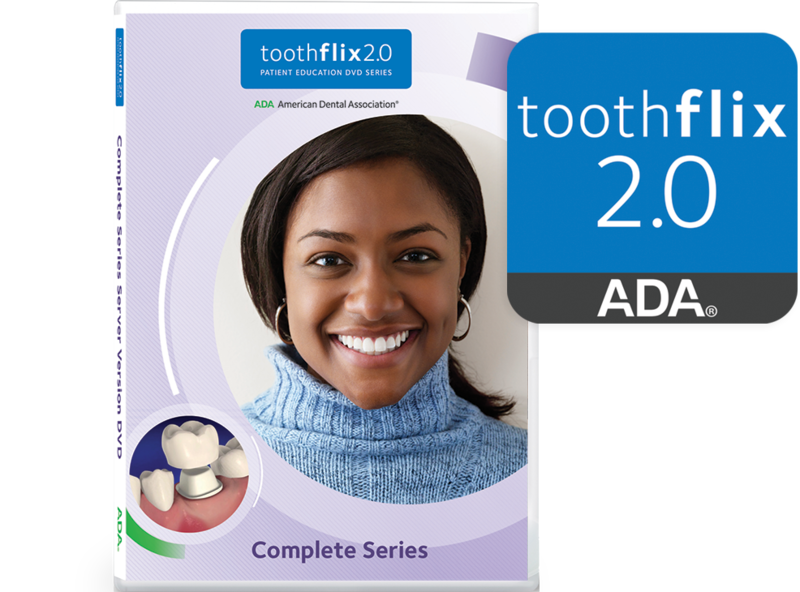 The app includes our updated Toothflix 2.0 videos in both English and Spanish, intuitively arranged for quick access. Email any of the 26 videos to patients before or after a consult; mark your favorite videos or even the exact video clips you show most often. App available for Apple devices only; Internet connection required; Dudley videos are in English only. Order from adacatalog.org, then complete your download on the App Store. Or for a free preview, go straight to the App Store. For details click on the Sample icon above. For a list of included videos click on the TOC icon above. For Toothflix demos and additional information, visit www.ada.org/toothflix. Click here to compare features of Toothflix and ADA PatientSmart.